Anyone who’s a longtime WTF With Marc Maron listener knows that the host has some tics. He loves to ask guests about “their guys,” often cites L.A. directions in comparison to the Comedy Store, and can’t really help but bring up some sort of vinyl-related matter. It’s to his credit, then, that only one of those tics—“your guys”—made it into Maron’s recent discussion with President Barack Obama. Or did it? 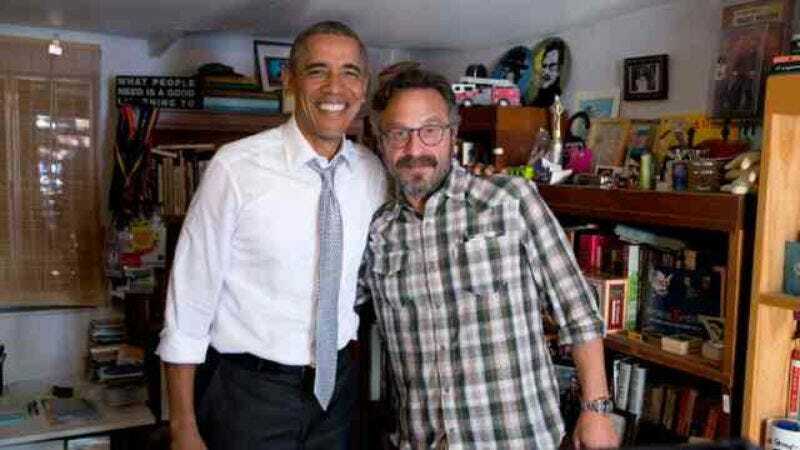 In a new Above Average video, “Marc Maron & Obama Interview Outtakes,” Maron subjects the leader of the free world (voiced by comedian Nathan Min) to some sketchy guitar playing, talks about flossing, and even makes the president sit through some Squarespace ads.